As species succession continues with time after fire, composition of the forest mosaic is greatly influenced by the forest fire frequency. Thus if fire frequency is high, the landscape will be dominated by pioneer species, principally intolerant hardwoods, whereas as fires become less frequent, later successional conifers become more abundant. 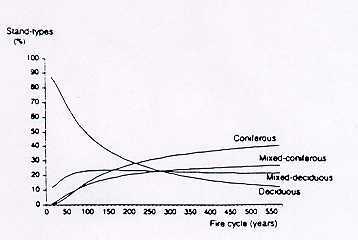 Figure 1 ( Bergeron et Dansereau, 1993) illustrates this landscape-level change for increasingly longer fire cycles. The fire cycle corresponds here to the time necessary to burn an area comparable to the Lake Duparquet Forest. The composition of the forest mosaic has an important influence on the vulnerability of softwood stands to spruce budworm outbreaks and could be determinant in the quality of certain wildlife habitat. Fig. 1. Proportion of stand types for different fire cycles using the 1983 forest map.